Expansion has officially begun in the level of services provided to low-income senior citizens in Florida's Duval County. 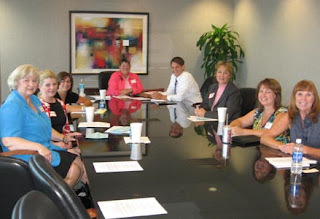 Building on the current efforts of dedicated Jacksonville Area Legal Aid (JALA), attorneys, paralegals and law school representatives met July 12 at the offices of Akerman Senterfitt to discuss plans for expanding services to low-income senior citizens in Northeast Florida. The expansion in services will be modeled after the Military Reservists Wills and Advance Directives Pro Bono project that has been offered to Navy and Army reservists at local military facilities. The Senior Citizen Wills and Advance Directives Pro Bono project will provide a two-day effort by the volunteers. Day one will include a group information presentation to residents of a HUD-subsidized senior citizen residential center describing the purposes of advance directive documents: Durable power of attorney, health care surrogate designation, designation of preneed guardian, a living will and a simple will. Day two will include an event at which interested seniors will meet with an attorney to execute the advance planning documents. The goal of the two-part project will be to provide low-income senior citizens with complete legal services to explain, create and execute advance planning documents.